This is the longest of the National Trails in the UK. Offering a wide variety of landscapes and seascapes, this often challenging path is amongst one of the finest long distance footpaths in Europe. 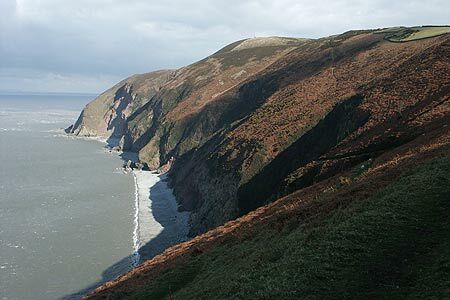 This 630 mile long National Trail starts at Minehead in North Somerset and follows the north coast west to Land's End. Turning east the path continues along the south coast to reach the shores of Poole Harbour where it terminates. On leaving Minehead the path enters the Exmoor National Park, the only one traversed in the length of the Trail. The first section is characterised by high cliffs and with limited accessibility by road there is a wilderness feeling on some of these early sections of the Trail. Entering Devon, the path crosses the Taw and Torridge estuaries to reach Hartland Point with its spectacular geology. Continuing into North Cornwall, the small harbour at Boscastle is one of many highlights, which underlines Cornwall's connection with the sea. Beyond St Ives the path enters the unique peninsula of West Penwith. Here the landscape is dominated by the elements as the granite land mass battles with the fury of the Atlantic Ocean. Reaching Land's End, the path turns eastwards to reach Penzance. The Lizard, the most southerly point in Britain, is the next major headland with its wild heathland contrasting with the magnificent coastline of multi-coloured cliffs, open bays and sheltered coves. A change of character takes the Trail along the drowned estuaries or ria coastline of South Cornwall with the Fal Estuary the third largest natural harbour in the world. Another highlight of South Cornwall is the soft landscape of the Roseland Peninsula with its wonderful beaches. Leaving Cornwall the Trail reaches the historic port of Plymouth before the rias of South Devon which include the Yealm, Erme and Dart. Torbay marks a return to busier resorts before the Exe estuary is reached. With red sandstone cliffs taking the path onto Sidmouth a change of geology means those white chalk cliffs now dominate the view ahead. Further east, beyond Lyme Regis, the cliffs rise to Golden Cap, the highest point on the south coast. After the tranquil landscapes of East Devon and West Dorset, the path arrives at Portland after traversing the length of Chesil Beach. The coastline accurately reflects the underlying geology and features such as Lulworth Cove, Durdle Door and Old Harry Rocks are always remembered by visitors and form an integral part of the 'Jurassic Coast'. Finally the path reaches Poole harbour where the walker who has completed the path can reflect on the diverse character of this the longest National Trail in the British Isles.